Your local SEO strategy starts with how you optimize your Google My Business listing. Because Google is the desired search engine for ranking, your Google My Business optimization will increase your organic search engine rankings, make your business visible on Google Maps, Local Finder, and in Google’s Local Pack. If you follow the guidelines for representing your business on Google you can claim your FREE listing with Google My Business and begin to tell your story with basic info like hours of operation, phone numbers, addresses, and even the types of payment accepted. Getting started is easy, simply visit https://www.google.com/business and begin the process of verifying and claiming your business by clicking START NOW. Mistakenly, many local business owners begin the process by claiming their business and they stop there. Once your claim your business, there are tons of other features that can be used to optimize your Google My Business listing and once it’s optimized it’s important to periodically perform checks of your listing to make sure it’s accurate as your business grows. Let’s dive deeper. As with any verification process these days you will be asked a variety of questions to verify and complete your Google My Business profile. These questions help to complete how your listing will look in Google search results and will help potential customers find your business and spread the word to others. Keep in mind, it’s important to fill in all the information about your business because anyone, even a competitor, can suggest an edit for your business. When your listing is in it’s infancy, someone can simply click on this button and make some dramatic changes to your Google My Business listing so it’s important to learn how to optimize your Google My Business listing by claiming, verifying, and optimizing your own listing. Although you will receive an email notification if someone tries to make an edit to your listing, it’s important to check it from time to time to ensure accuracy. 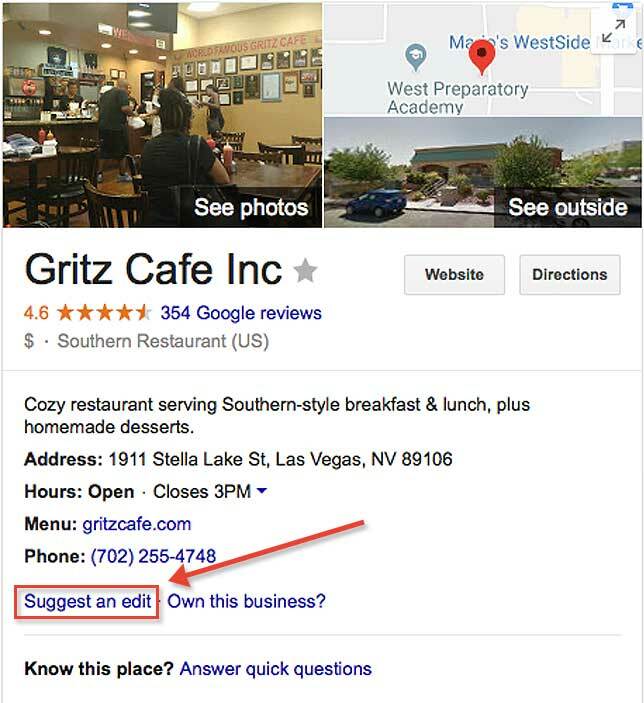 Edits are not always a bad thing as Google encourages customers to answer questions about your business to help build a more complete business listing. This can be done when the customer clicks on Know this place, and here they will be asked questions pertaining to your business. Customers ‘in the know’, can answer these questions and if not they can say no and move on to the next question. This process of customer interaction may seem reckless to some business owners who think all competitors are out to get them but Google encourages customers to help improve Google search results with ‘user generated content’ to help build a community around the search engine and your business listing. This also aids the Google algorithm with search strategy implementation. Remember, once your listing is verified, optimize your Google My Business listing by continuing to check it regularly. 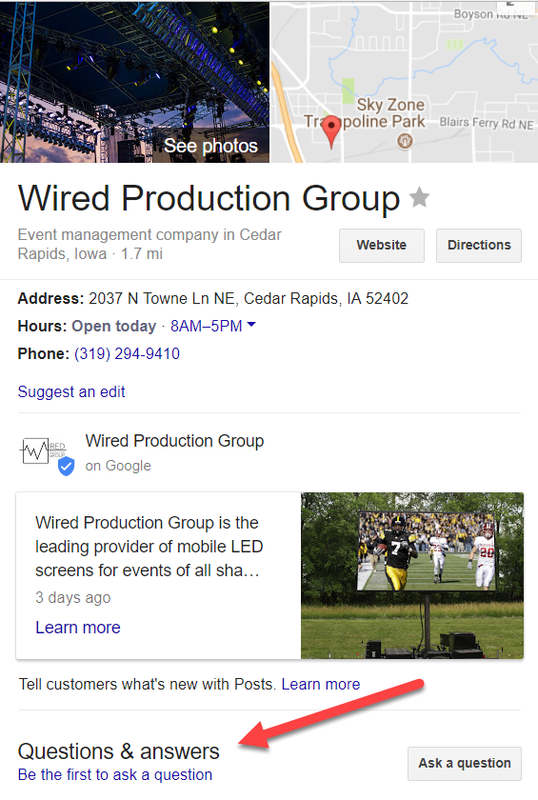 Another way to optimize your Google My Business listing is by using one of Google’s latest features called Posts, which are like small ads that lets you publish your events, products, and services directly to Google Search and Maps. By creating posts, you can place your timely content in front of customers when they find your business listing on Google. Once you’ve published a post, it will appear to customers on Google Search and Maps in a few moments. To ensure that posts are timely, they’re removed from the default view after 7 days (or when the event date the post referenced has passed). However, a historical view of posts is shown under the “Posts” tab on mobile. Make your posts more engaging by adding links, images and even call to actions. Hosting a webinar? Set up your even post by adding date, time, and even a link to the registration page. Promoting a sale has never been so easy with posts. In addition to sales, you can also promote individual products with picture and links. Highlight popular blog posts with a short description and link to the blog post on your website. Spread holiday cheer by giving customers a holiday message post. TIP TIP: Adding an image to your Google post will increase the post’s engagement, as most photos do, but just like adding any profile or icon photo it’s important to play around with different size images to ensure proper display on post images can be a bit wonky in Google Maps. 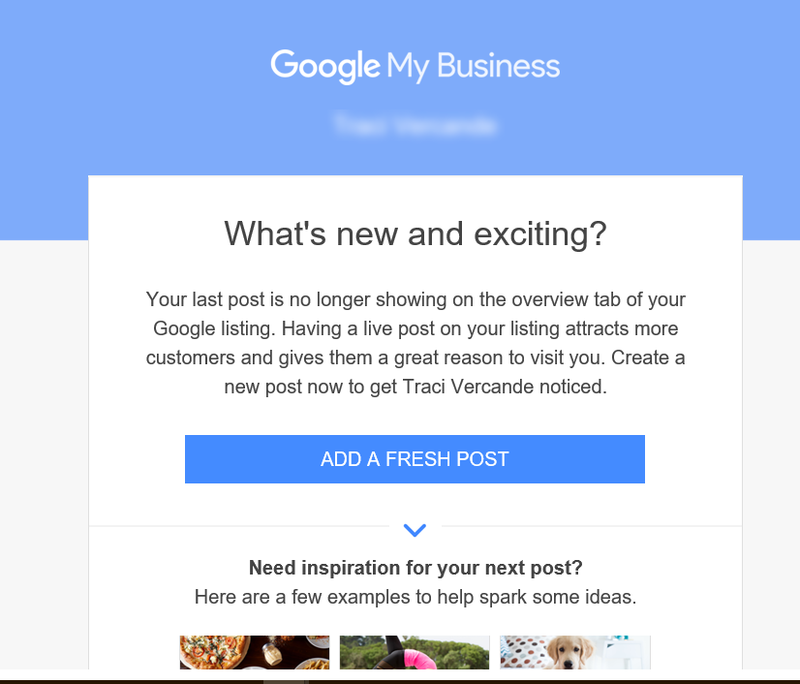 What are some other benefits of using Google My Business Posts to promote your event, product or service? Does it help with search rankings? You would think that by utilizing any Google product that you would increase search rankings, and this is no different, studies show that making Google My Business Posts can improve rankings. 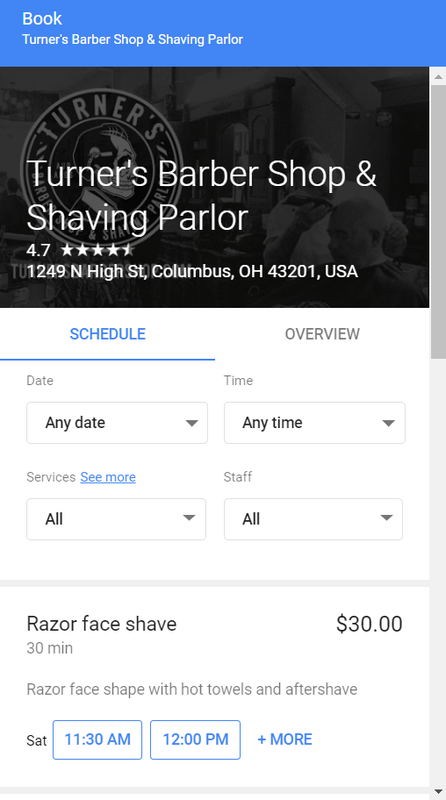 Another way to optimize your Google my business listing is by using Google’s Booking button feature so your customers can book appointments online. This feature can really make your business stand out from the crowd. So if you’ve been paying for scheduling software cancel it. Even if your scheduling software is free, you would be better with Google’s booking feature as this would help fill in your profile in greater detail. Why not make it even easier for your clients and potentials to be able to do everything from your Google My Business listing. For those using Google’s supported scheduling providers, the booking button pops up automatically in your Google My Business listing. Google has made it even easier for your potential customers to contact you directly with messaging. 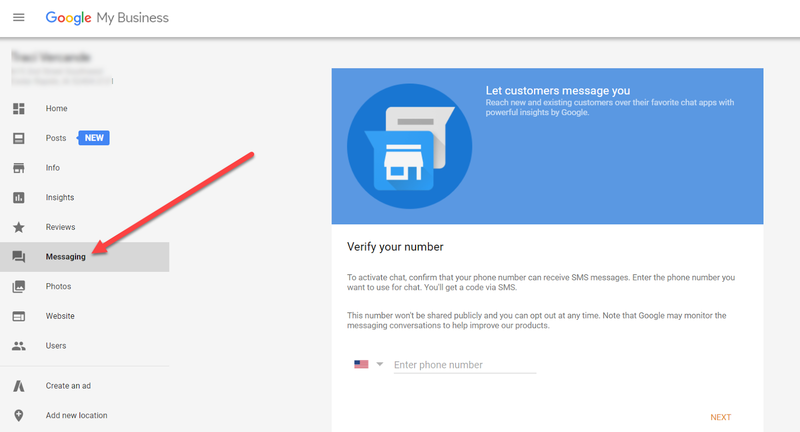 The best part is they don’t have to be sent to your personal phone number, simply download Google’s Allo app, and set up an account with the same number you have set up for your Google My Business account. Now when a customer sends you a message it appears in the Allo app as a notification rather than in your personal message inbox. While this may be a great way for your customers to reach you, it’s still new, so currently it’s only available to customers on a mobile device doing a web search using Chrome. This means that users on Google Maps or viewing your business profile in the Knowledge Panel will not be able to see it. 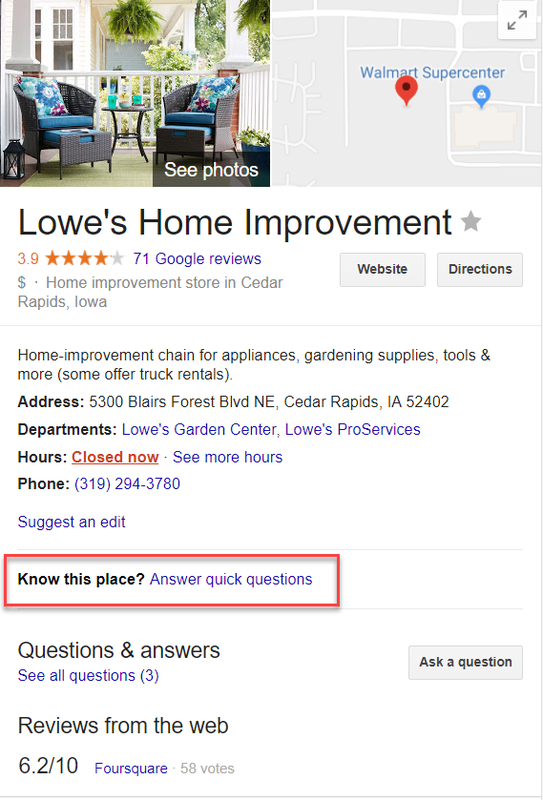 Google My Business Questions & Answers is just as it sounds and it allows you to answer customer questions on Google. 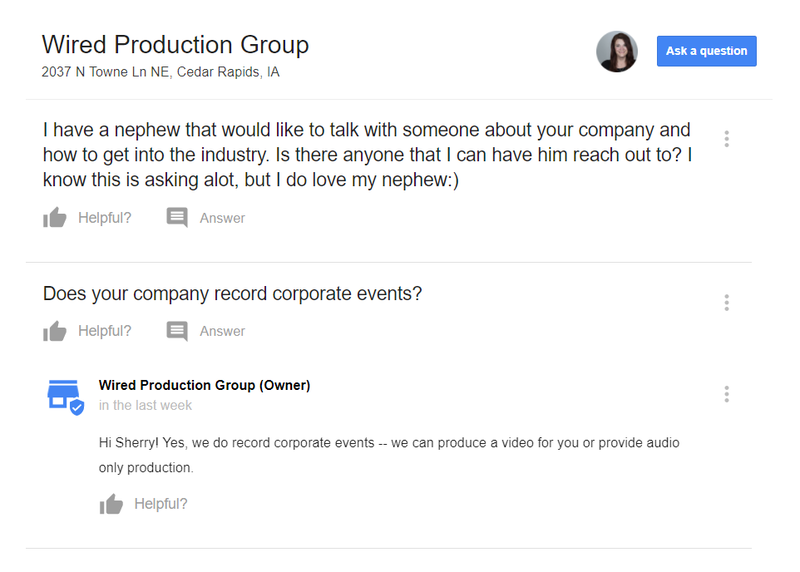 This feature allows customers to get questions about your products or services and also stands as a reference for future customers who come to your Google Business Listing. This feature is not visible on the mobile Google My Business app. You have to login to the Google My Business dashboard to check for new questions that need answering. 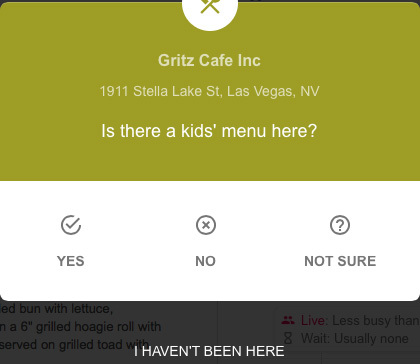 You can only monitor question on an Android device. To do this, get the Google Maps app and sign in with the same email address as your Google My Business listing to get much notifications when someone asks a question. TIP TIP: Just like with “Suggest an Edit” in your Google My Business listing, anyone can answer questions asked of your business so it behooves you to stay on it by checking your profile and answering these questions as quickly as possible. If you come across a case of abuse, you can find help here Google My Business support forums. Unlike Yelp, which discourages business owners to ask their customers for reviews, Google encourages the ethical ask of their customers and clients for online reviews. 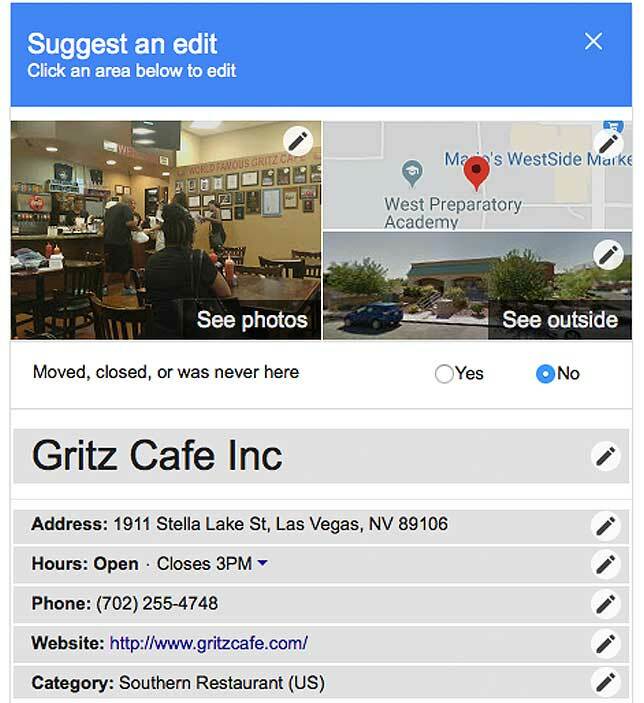 In addition to helping your business stand out from competitors, online reviews appear next to your business name in the Knowledge Panel and in Google Maps. You can ask your customers for reviews if you follow Google’s guidelines for Google My Business reviews, however, if you violate any of these policies, the reviews could be removed. What happens if you get a negative review? First, don’t freak out. Look at this as more of an opportunity than something negative. Everybody has a bad day and most people recognize that. Also, if you have a troll that gave you a one-star review and left a nasty comment, most people with common sense recognize that review for what it is. It’s generally not worth stressing over. 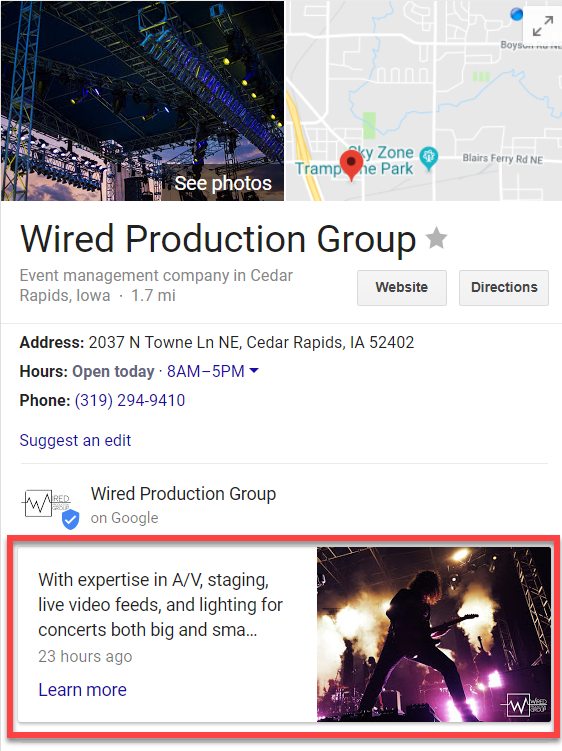 Hopefully you can now use some or all of these tips to Optimize Your Google My Business Listing. If there are still some things that are a bit foggy, please let me know in the comments.